According to World Health Organization (WHO) 7 million people die each year due to tobacco smoking related diseases. 6 million of these deaths are due to direct smoking, while 890,000 are the result of non-smokers being exposed to second-hand smoke. Nearly 80% of the more than 1 billion smokers worldwide live in low- and middle-income countries, where the burden of tobacco-related illness and death is heaviest. Smoking related diseases take away people’s ability to work and help in the growth of the economy. This not only affects their families but the countries’ economies as well. What is contained in Cigarettes? This is the substance to which smokers addicted because once it is inhaled it enters the bloodstream and stimulates the brain by giving it a ‘head rush’, making one crave for more each time the level of nicotine in the blood falls. This gas affects the capacity of blood vessels to carry oxygen in the blood. Blood vessels carry less blood causing health problems. This substance contains many chemicals and is deposited by smoking in different parts of the body, including the lungs and blood vessels. a) Lung Cancer: Smoking increases your risk of getting lung cancer. Out of every 10 cases of lung cancer, 8 cases are due to smoking. b) Chronic Obstructive Pulmonary Disease (COPD): This disease affects the lungs making it hard for a person to breathe. It can cause long term disability and even death. c) Asthma: This disease also causes difficulty in breathing due to irritation of the air ways. d) Emphysema: This disease destroys the victim’s ability to breathe because it severely reduces the amount of oxygen reaching the blood. The disease has no cure and is irreversible. 2. Different types of Cancers: Apart from lung cancer, smoking is a common cause of many other types of cancers, including but not limited to, colon, liver, pancreatic and cervical cancer. 3. Heart Disease: This results from blockages and narrowing of the arteries causing less blood and oxygen flow to the heart. 4. Stroke: This occurs when blood supply to the brain is temporarily blocked and, in this case, due to blockage of the arteries caused by smoking. When brain cells lack oxygen they die and that can, in turn, affect the function of the brain and cause speech problems, paralysis and even death. 5. Diabetes: Smoking increases one’s risk of getting type 2 diabetes. Those who suffer from such diabetes are at risk of suffering heart and kidney related issues as well. 6. Eye disease: The risk of eye defects like cataracts, even blindness, is increased by smoking. 7. Bone-related problems: Smokers are more at risk of suffering from diseases such as rheumatoid arthritis, than those who do not smoke. 8. Ulcers: Smoking causes inflammation and irritation in the stomach and intestines that can lead to ulcers in the digestive system. Bad smell: Smoking causes the mouth and even clothes to have bad smell. Safer pregnancy: Smoking in pregnant women is linked with an increased level of abnormal pregnancies such as ectopic pregnancy, where the fertilized egg attaches itself to the fallopian tube instead of the uterus. Smoking during pregnancy increases the risk of miscarriages, still births, early delivery, low birth weight in infants and Sudden Infant Death Syndrome (SIDS). Premature ageing: According to the American Academy of Dermatology, smoking leads to biochemical changes in the body that speeds up the aging process. Impotence: Smoking increases the chances of impotence dramatically for men by affecting blood vessels, including those vessels that must dilate for an erection to occur. Increased infections: One of the toxic effects of cigarette smoke is the paralysis of the cilia, the effect of which is to destroy a core protective mechanism in cells, and so make smokers more at risk of infection. Smoking is expensive: In Kenya, the average cost is about $3 per pack, and in some states, it can be as high as $5. Reducing second hand smoke: As mentioned earlier, 890,000 deaths a year are caused from non-smokers being exposed to second-hand smoke. Loss of memory: Smoking affects the memory. Quitting can improve it. It is important to remember that the pain people go through when fighting smoking related diseases such as cancer, emphysema and other respiratory conditions, is almost indescribable, and the costs that come with them are extremely onerous. For example, when treating lung cancer, the surgery that one goes through to remove the tumour, the chemotherapy, the radiation, and the lengthy stay in the hospital can be costly and depressing. During and even after treatment, some people are unable to eat normal food because their throats have been damaged by cancer, are unable to breath normally, are unable to speak clearly, are unable to walk and do everyday duties for themselves, are unable even to go out with friends and socialize especially if they are confined to the house, such as in the case of Chronic Obstructive Pulmonary Disease (COPD). 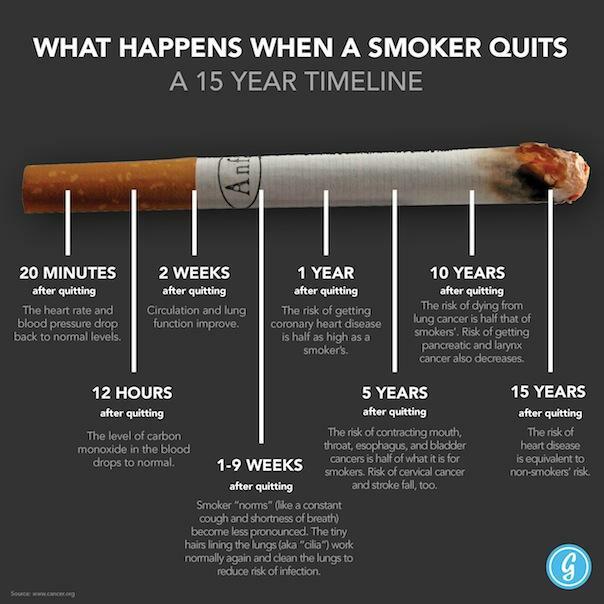 In conclusion, no matter how long you have been smoking, quitting today will, without a doubt, improve your health. The first step is making the decision to stop a habit. The next step is to be strong and if you do relapse, not to let that cause you to go back to smoking permanently. Most people relapse 3 times before they can quit smoking for good, so don’t get discouraged if you are not able to quite on your first try. Seeking help and support as you go through the journey to be a non-smoker can give you more strength to fight the addiction. For better health, stop the habit now. It is our hope at IMT, that this article will help people to quit today. Treating conditions in its early stages is less costly and more likely to be successful. How IMT can help if you need to go overseas for medical treatment? We, at International Medical Treatment (IMT), are experienced facilitators who can link you with the best specialists in our partner hospitals in India, Dubai and Thailand.